A woman in her 40's presented with multiple "spells" in the past week, with increasing frequency. She feels lightheaded, then becomes unresponsive. It usually lasts about one minute then resolves. She has had no chest pain. She has a history of seizures as a child but there is no seizure activity during these spells. During this rhythm she was awake, protecting her airway, with pallor, diaphoresis and cool extremities. Pulses were present. There was no respiratory distress. There is bigeminy. Narrow complexes are preceded by P-waves. The QRS associated with the sinus beats has right bundle branch block (RBBB), and do not appear to have very long QT intervals (I calculated 400ms QT divided by the square root of the preceding R-R interval = 460ms). The intervening Ventricular complexes (PVC's) look very bizarre with a long QT. The PVCs have large ST elevation (II, III, aVF) with reciprocal ST depression (aVL, precordial), suggesting inferoposterior STEMI, but this is clearly a mimic because the intervening sinus complexes have no ST elevation. First, what kind of VT is this? Polymorphic VT. PMVT is defined as a wide complex ventricular rhythm at rate over 100 with rapidly changing QRS axis and/or morphology. Polymorphic VT is either torsades de pointe (associated with a long QT on the baseline 12-lead ECG) or non-torsades (usually associated with ischemia or other organic heart disease). The presence of QT lengthening on the baseline 12-lead ECG is not always obvious. Torsade de pointes means "twisting of the points" and refers to the changing axis around an isoelectric line. Morphology of the PMVT (i.e., presence of twisting of the points) alone cannot distinguish PMVT due to long QT (torsades) from that due to other etiologies (non-torsades). It is virtually impossible to distinguish pulseless PMVT from ventricular fibrillation, and studies have shown that the majority of pulseless rhythms that appear to be torsade (with "twisting of the points") are really ventricular fibrillation. This distinction has no implications for immediate management (defibrillation) but it does have important implications for preventing further dysrhythmias. 1. Acquired: due usually to drugs. The list is long. Also due to electrolyte abnormalities, especially hypoK and hypoMg. Corrected QT interval (Bazett correction = QT divided by the square root of the preceding R-R interval in milliseconds) is usually great than 600 ms. Torsades in acquired long QT is much more likely in bradycardia because the QT interval following a long pause is longer still. Thus, torsades in acquired long QT is called "pause dependent": if there is a sinus beat after a long pause (which creates a longer QT interval), then an early PVC ("early afterdepolarization," EAD) is much more likely to occur during repolarization and to initiate torsades. 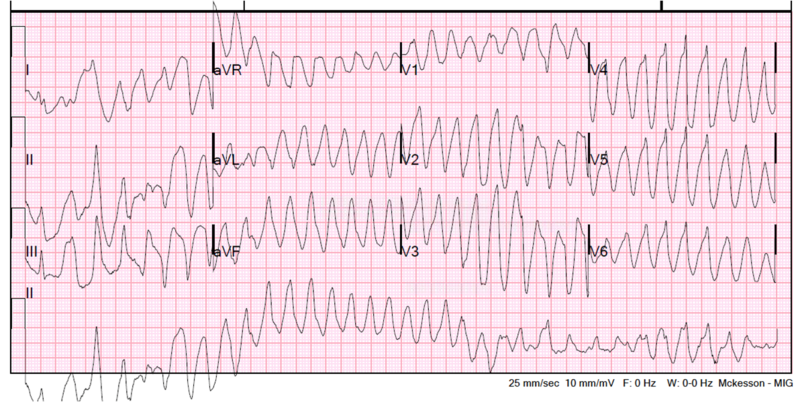 The usual sequence is: sinus beat, then early PVC, then a long pause because the PVC was early, which then results in a particularly long QT, then another PVC with "R on T" that initiates torsades. 2. Congenital, especially Congenital Long QT Syndrome. Unstable PMVT due to congenital long QT is much more rare. (In 26 years of EM and 125,000 patients, I have never seen a case of torsade PMVT due to congenital long QT). Congenital causes of torsade include "catecholaminergic PMVT," in which there is no visible QT lengthening on the 12-lead, but it is believed to have a similar etiology. Preventive therapy of Congenital long QT includes use of beta blockers (same with catecholaminergic PMVT, as in both of these, beta stimulation provokes torsade); this is in distinction to acquired long QT, which may be treated with beta stimulation (isopreterenol). I have not found any recommendations to use beta blockers for acute management of torsade in this group, but it is nearly impossible to tell if isoproterenol will make things worse, or better, for any given patient with congenital long QT (see comment by our electrophysiologist at the end). It seems that most symptomatic patients with congenital long QT present after syncope, or resuscitated v fib, and rarely present with continuing torsade or instability. Thus, the management of these patients is primarily recognition and prevention of future syncope and sudden cardiac death, usually with an implantable debribrillator in addition to beta blockers. Torsades from Congenital long QT can be induced by use of QT prolonging drugs. Most commonly due to ischemia. These will almost always be overt, severe episodes of ischemia, with chest pain and/or unequivocal ischemic ECG abnormalities. Also due to pre-existing cardiomyopathy. Most torsade is self-limited. If it does not spontaneously convert, then it needs defibrillation if the patient is unstable. If it does convert, then it is likely to recur, and therapy is aimed at preventing recurrence. 6. If these do not work, then overdrive pacing, usually at a rate of about 100 to prevent any pauses, will almost always work (transcutaneous pacing is fine for temporary relief as a bridge to transvenous pacing). 7. Lidocaine may also be of benefit because it can suppress the PVCs (early afterdepolarizations) which initiate torsade if they occur on the T-wave. 9. Do not give beta blockers unless the patient carries a diagnosis of congenital long QT. Just the opposite: isoproterenol. 10. If it is congenital [congenital long QT, or catecholaminergic PMVT (which has a normal QT interval)], then acute beta blockade may be indicated. I would try esmolol first, as it can be turned off. However, it does not have beta-2 blockade and it is unclear to me if this is important and/or necessary. If esmolol does not work, then IV propranolol should be given. Propranolol and Nadolol are the best long term beta blockers for congenital long QT and the beta 1 selective metoprolol is not very effective. Whether this is due to the beta selectivity is not clear to me. Here is a fascinating case of congenital Long QT with Torsade. There is a great discussion of the role and function of beta blockade in congenital long QT. 3. Prevention of further episodes with lidocaine or amiodarone, possibly a beta blocker such as esmolol (which you would avoid in any acquired long QT Torsades). Cardioversion is indicated only when the patient is in torsade, and will only work temporarily, as the patient goes in and out of the rhythm. Prevention of further episodes is essential. In this case, we only see a long QT on the PVCs, but not in the native RBBB beats. Often the torsades is "pause-dependent" and can only be seen in a complex that follows a long pause. There is no chest pain, and we do not have evidence of ischemia on the sinus ECG complexes. For polymorphic VT to be due to ischemia, there is usually some unequivocal ECG findings of ischemia. So all this is suggestive of torsades, but not diagnostic. The patient was not on any known medication that lengthens the QT interval. She has only a history of Graves disease and reports that she has been off all medications. When not in VT, her BP is elevated at 190/80 with a palpable pulse of 90 and oxygen saturations of 99. An initial K returned normal. Mg level was unknown at this point. At t = 12, 2 grams of IV Magnesium were given. At t = 30 minutes, there was no improvement and esmolol bolus and drip were given. 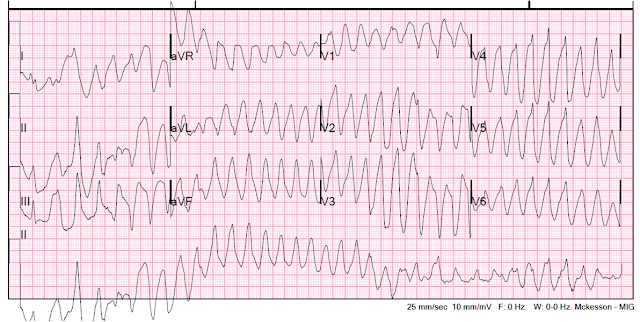 [This would in fact be contraindicated for Torsades, but reasonable if this were ischemic PMVT. Although a bedside cardiac ultrasound had poor contractility, suggesting Non-torsades PMVT, Torsades is much more likely without clear ischemia on the ECG.] Isoproterenol should be given. The cath lab was activated. Another 2 grams of IV Magnesium was given. t = 64 minutes: K returns at 2.4 mEq/L (initial value was mistaken). This suggests Torsade even more strongly. KCl given in central line. Amiodarone drip started. Rectal aspirin given. The patient was taken to the cath lab and a pacer was placed. The rhythm was captured with overdrive pacing and then slowed. There was diffuse coronary disease, but no culprit lesion (no acute coronary syndrome). Troponin was negative. It was found that the patient was on methadone and was methadone toxic. It is one of the many medications that causes a long QT. This was Torsade de Pointes due to long QT due to methadone and hypokalemia. Because of the extraordinarily long half life of methadone, it took days for the QT to shorten. Ultimately, the patient did well. For congenital long QT, beta blockade is indicated chronically, and for a patient with recurrent VT who is in the hospital, one would NOT give isoproterenol. Only acquired long QT is "pause dependent" and improved with a faster heart rate, and beta blockade is NOT indicated. Rather isoproterenol is indicated (and overdrive pacing). Can you correct me on this?" Do you use isoproterenol for overdrive pacing in patients who are going in and out of Torsades due to congenital long QT? If so, how does that square with the use of beta blockers in congenital long QT? "I wish things were clear enough to put everything in an algorithmic format… but unfortunately that’s not the case." It really depends what type of congenital long QT you are dealing with, and even if you know – things are not as straight-forward. Congenital Long QT type-3 is a sodium channel mutation (SCN5A) – which is the same gene as Brugada syndrome. Long QT type 3 do have pause dependent Torsades. However, beta blockers are still used in this situation (after of course atrial pacing has been instituted to prevent bradycardia) – this is primarily for the effect of beta blockers on decreasing the QT dispersion. Even more complicated… class I-B sodium channel blocker (Mexiletine) is used sometimes for LQT-3. To my knowledge the beta blockers are not probably as effective in LQT-3 as in other forms – but are still used. Therefore, I do not think it is possible to come up with a Yes/No answer with the knowledge we have at this time – things have to be taken in clinical perspective. If someone clearly is having pause dependent torsades, and is not being paced – I will NOT use beta blocker, but rather try to increase the rate by using isoproterenol. this is one of the confusing topics – in fact, most of the genetic arrhythmias / chanellopathies are quite challenging to manage clinically. We are so much used to seeing data from thousands of patients in cardiology trials – and then we get into such situations where the disease burden is not huge enough to give us data other than registries from large clinical centers. Thanks for the interesting case and the recommendations on what to do in this difficult scenario. "An initial K returned normal. This suggests Torsade even more strongly." Since hypokalemia is one cause of acquired long QT and therefore torsades, shouldn't a normal K be a piece of information against torsade? The true K value (2.4) which returned later would be the value that is suggestive of torsade. Or am I confused about something? 2) When you have a patient with PMVT and it is not immediately obvious whether it is torsades or non-torsades, do you think it would be wise to go ahead and give say 2 grams of Mg even without having a Mg level back yet? 1) Ouch. That was a misprint that was left over from editing and I didn't catch it. I will fix it. It is the K of 2.4 that "suggests Torsades even more strongly." 2) Yes, Mg no matter what. and correction of K no matter what. In ecg no 3 from top there is 2-3mm st depression in leads v2-v4. For me it suggests IHD and points towards ischemic origin VT!! It is a good observation. However, this is RBBB, and one expects some proportionally discordant ST depression in right precordial leads. Since the R' wave in V2 and V3 is so large, I don't think the ST depression is excessive. Great case! I think it looks very suggestive of IHD with ischaemia present in numerous leads. It also looks like Torsades from the 12 lead by the distinctive twisting of the points seen in the first 12 lead. Yes, it is tricky because it was not due to IHD, rather to methadone long QT! My name is Sarah Sherwood, and I am a fourth year medical student at Columbia. I look at your site all the time, and find it so educational and fascinating, thank you! I am working on writing comprehensive clinical cases (each with an embedded EKG) to help students hone and maintain their EKG interpretation skills. One case involves a congenital long QT syndrome w/ an EKG showing torsades; I have been unable to find a good TdP EKG in our EMR, so I was wondering if I could use the polymorphic VT EKG you have on this page (with reference to your site of course) in one of my cases? i was a fourth year medical student at Columbia in 1981. i recall making rounds with the ID attending, and his saying after i responded to one of his queries (and there were 4 other students there): "Fiero, you're not as stupid as you look". thank you , Steve , for another incredible blog. LOL! thanks for the feedback! Do you have any references to support your assertion that "it is certain that [in congenital long QT syndrome], in contrast to acquired long QT, isoproterenol should never be used"? I have spoken to multiple pediatric and adult electrophysiologists who disagree with this and I have been unable to find any literature supporting your statement. Thanks in advance. Thanks for your question. And I it brings to light that my statement is incorrect. I should instead say that it is very complicated, and it is virtually impossible for an emergency physician to know whether isoproterenol will make things worse or better. Can you correct me on this? I wish things were clear enough to put everything in an algorithmic format… but unfortunately that’s not the case. Long QT type 3 do pause dependent Torsades. However, beta blockers are still used in this situation (after of course atrial pacing has been instituted to prevent bradycardia) – this is primarily for the effect of beta blockers on decreasing the QT dispersion. Therefore, I do not think it is possible to come up with a Yes/No answer with the knowledge we have at this time – things have to be taken in clinical perspective. If someone clearly is having pause dependent torsades, and is not being paced – I will NOT use beta blocker, but rather try to increase the rate by using isoproterenol. Thanks to you, I have corrected the post! Atrial Flutter with Inferior STEMI?